Through making making contact with the Serbian Embassy in London, we were put in touch with Dejan Kovacevic who worked in Provincial Secretariat for Interregional Co-operation and Local Self-Government for the Goverment of Autonomous Province of Vojvodina. Between Dejan and ourselves, we identified SOS Kinderdorf as the intended recipients of the £1500 donation. SOS Kinderdorf is the local branch of an international organisation who provide quality alternative care for children who cannot live with their biological families. SOS Kinderdorf Novi Sad is a small “village” of some 13 houses and some Admin building set amongst woodland in the area of Sremska Kamenica on the outskirts of Novi Sad. 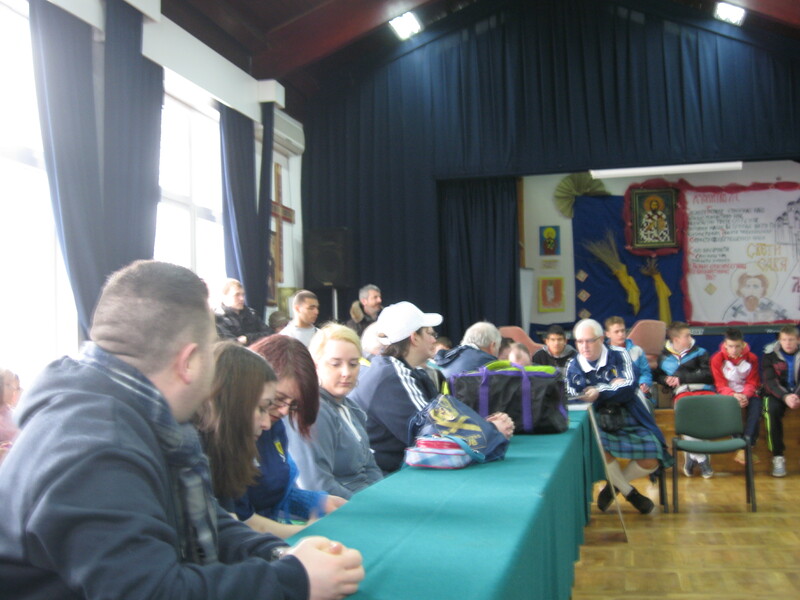 The presentation was arranged for the morning of the match, Tuesday 26 March. Dejan had kindly arranged transport for the Seventeen Sunshine Appeal Steering Group members and supporters who had given of their time to visit the children. We were picked up at 09:30 at a hotel in the city centre and taken through the snowy streets and villages to Sremska Kamenica. On arrival we were led into the Main Hall and were overwhelmed by the number of children, staff and media that were present. Speeches were made, presentations were done. Mr Branko Vujovic, councellor in the Provincial Secretariat for Sports and Youth in the Government of the Autonomous Province of Vojvodina said a few words on “Fair Play”. The Director of the Village, Mrs Milena Vasic-Stupar, presented the Sunshine Appeal with a certificate acknowledging “Generosity and Humanity”. The Sunshine Appeal presented the Gift Cheque and a motion from the Parliament of Scotland, citing the excellent work done by both the Tartan Army Sunshine Appeal and SOS Kinderdorf, Sremska Kamenica that had been signed by several MSPs. After the formalities came a tour of some of the houses that the children stayed in. Some of our number accepted the challenge from the youngsters to a football match. 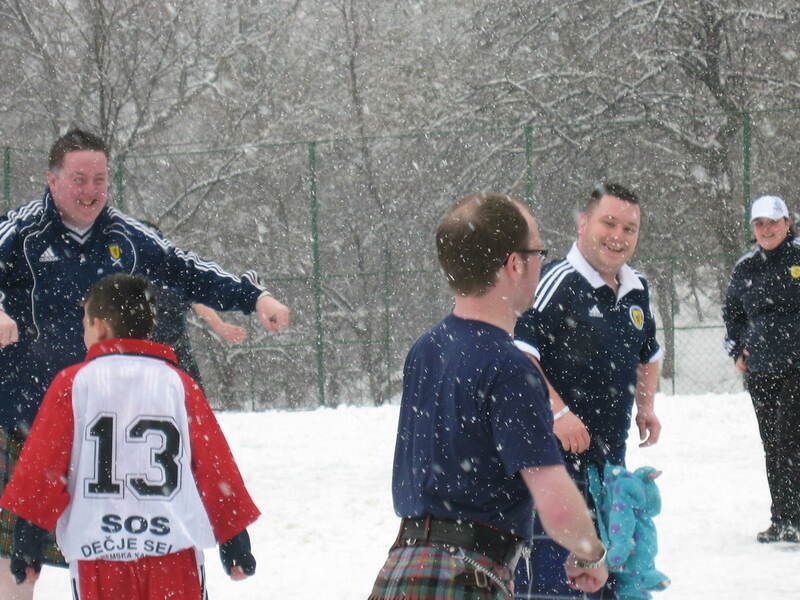 The match was played in atrocious conditions with driving snow and snow underfoot. I am delighted to be able to report that Scotland won 5-3. 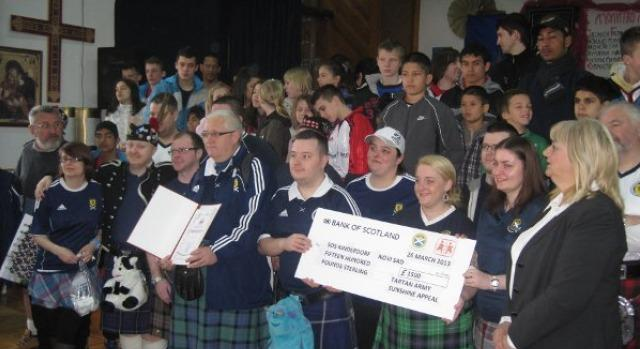 Some of you will know, indeed some of you may have sent it, that we collected cash money from Scotland fans who had made the trip and who either handed the cash over personally or posted it to the Sunshine Appeal. We can now report that, with the help of the good offices of Heineken UK and, in particular, Angus Steven, and Aleksandar Dragovic of the wider European Heineken network, that cash (equivalent to £490) has been handed over to Mrs. Milena Vasic – Stupar , Director SOS Kinderdorf, Novi Sad.